- The AdiuMSN Emoticons belonging to bob_the_gorilla. - The steel contact list background taken from mr_misanthropy's GoneDark message style. -The GoneDark Message Style belonging to mr_misanthropy. - My Steelish Graphiti contact list colour theme. - The wallpaper I currently use. - My Steelish status icons. - My new Phantastical (Steelish) CG contact list style. - The Skype Sound set v1 belonging to blckleprd (I liked version 1 better than version 2). - My Steelish dock icon. Hope I've credited everyone appropriately and I hope you like it. Yay! I'm an influence! Cool set. Haha yup. Well I did actually think about doing something like this some time ago with a whole set of all my Xtras and whatever but I wasn't sure how to go about it, or if anyone would go for it so yeah we'll see how this goes. Yay! I'm a slightly less influential influence! Awesome. I LOVE it. Also I love Mango's Set!! hey! cool post! I was wondering how do you make the menu bar change to that dark colour!?? yes, I must inquire as well to the name of the theme you are using. The theme's name is BlackBerry 1.0. 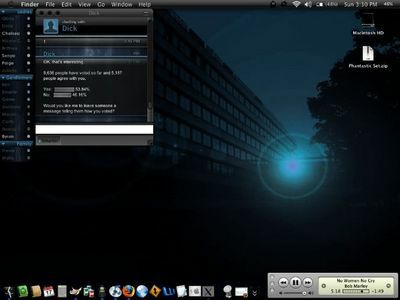 So in reply to all mugz and nintendology you can download a program to change the Mac OS default aqua theme such a program is ShapeShifter which I use and it's great and simple. Pretty much after looking through the ShapeShifter, which will be installed in your system preferences as a preference pane, you'll probably understand how to change everything around, not just themes though you can change cursors, desktop pictures and icons. But as for finding themes to use theres loads of sites with exactly that. Hopefully that explains it. Sorry, the links didn't work. I love the ShapeShifter theme as well. Thanks. How do you get your Chat window top (normally light gray) "grasps" to be dark gray, and the 3 buttons to be dark? OHHHHHHHHHHHHHHHH, you used Shapeshifter for that...I got it now. Nice color and sheep, fantastic, whic one apps you use for modding..?? Hopefully they're all within the description.